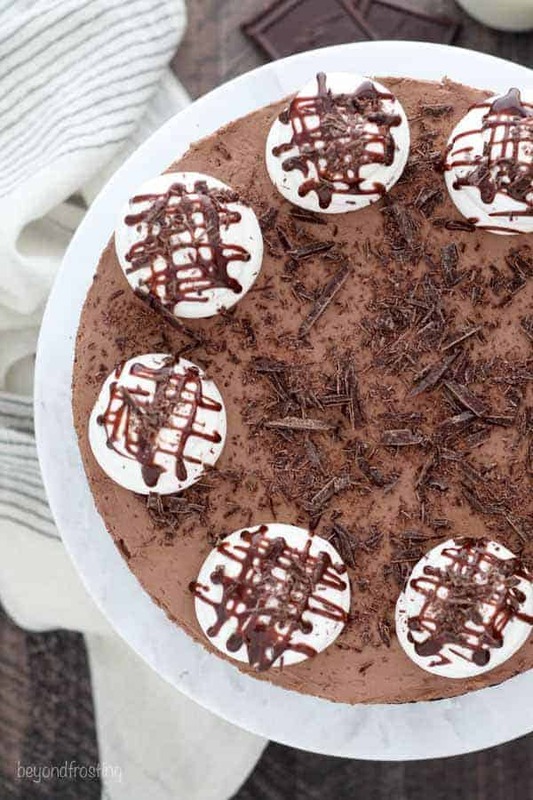 This No-Bake Baileys Cheesecake is rich and decadent chocolate cheesecake, but still very light in texture. 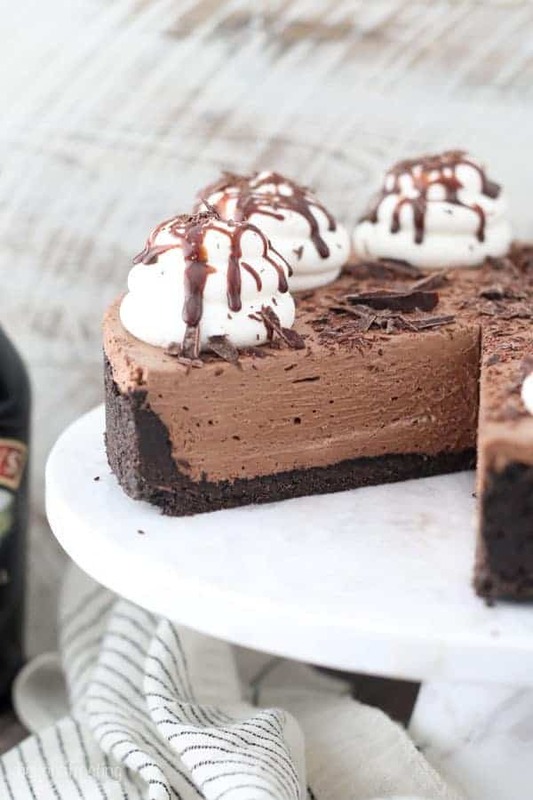 The cheesecake is flavored with a mixture of cocoa powder and melted chocolate plus Baileys Irish Cream liquor. 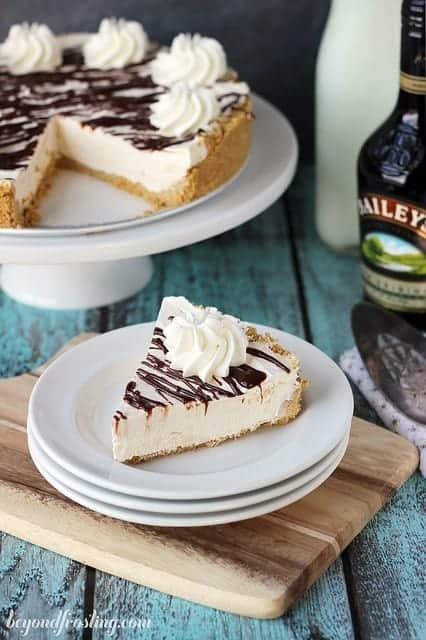 This Bailey’s Irish Creme cheesecake isn’t just for St. Patty’s Day! I am finding myself in a mad state of trying to prepare for my wedding, which is about 3 weeks away. Between blogging, working and wedding planning, there is little free time. I want to be sure you guys are covered with desserts while I am taking some time off for the wedding, so I am trying to prepare lots of recipes ahead of time so I don’t have to worry about it! Try making several desserts each weekend while trying to also follow Weight Watchers. It’s a challenge for sure, but it helps keep me more accountable for myself. In this way, I can avoid eating an entire slice of No-Bake Baileys Chocolate Cheesecake. I recently remade my Baileys Irish Cream Cheesecake Shooters and realized just how amazing that dessert is! While it’s not always efficient to make parfait desserts, I decided to adjust the recipe for a 9-inch cheesecake. This cheesecake is rich and decadent but still very light in texture. 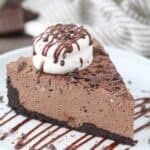 The chocolate cheesecake is flavored with a mixture of cocoa powder and melted chocolate plus Baileys Irish Cream. When I brought this dessert into work, word spread fast and it was gone so quickly. Pretty much any desserts that is spiked with a little bit of alcohol is alright by me. I have an especially hard time following my two-bite rule when it comes to these types of desserts. 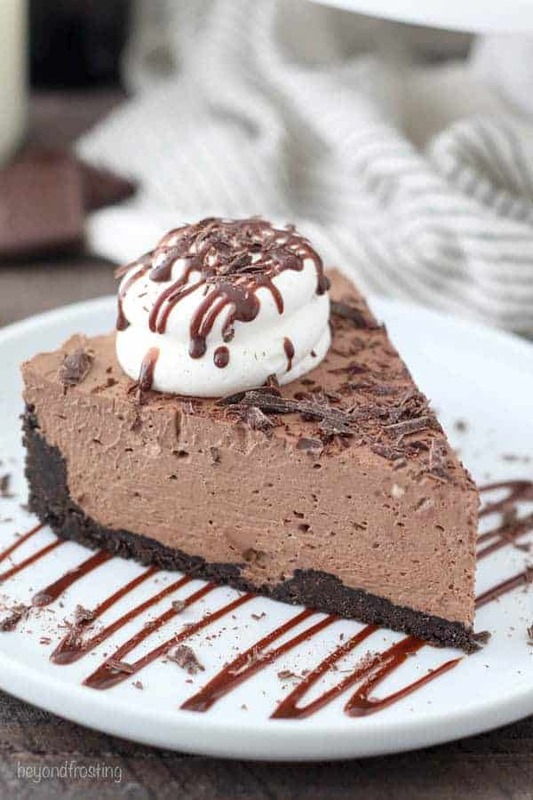 I even made a baked version of this Baileys Chocolate Cheesecake at one point as well. 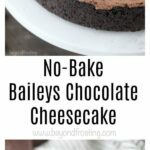 The base recipe is similar to the one I used for my Easy No-Bake Chocolate Cheesecake with just a few minor tweaks, such as the Baileys Irish Crème. I find that this is one recipe where using a high-quality chocolate is the key to success. I do not recommend using chocolate chips, because the coating on the chocolate chips have a different texture from a bar of chocolate or chocolate specifically made for melting. I always recommend using a bar of high quality chocolate such as Ghirardelli Chocolate Bars, Bakers Chocolate or my recent favorite being Callebaut Callets. One other thing I did different for this cheesecake is that I added some cocoa powder into the whipped cream. Not only does it add to the overall chocolate flavor but it helps hide those parts of the whipped cream that don’t get quite mixed into the filling! This means no more white streaks in your chocolate cheesecake. Sometimes I feel like I can’t get enough of these no-bake cheesecakes. There are so many flavor combinations and ways you can make it personalized. I chose to top this with some hot fudge sauce and chopped chocolate bars. 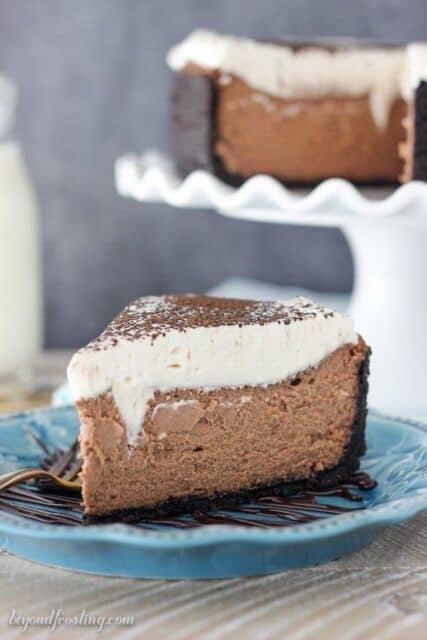 This No-Bake Baileys Cheesecake is rich and decadent chocolate cheesecake, but still very light in texture. The cheesecake is flavored with a mixture of cocoa powder and melted chocolate plus Baileys Irish Cream liquor. Prepare the whipped cream. Pour 1 ¼ cups heavy whipping cream into the chilled bowl. Use an electric mixer to beat the heavy cream on medium-high speed until the cream starts to thicken. Slowly add the powdered sugar and ¼ cup of cocoa powder and continue beating on high speed until stiff peaks form. Set the whipped cream aside. In a microwave-safe bowl, melt the chocolate in 30-second increments, stirring each time until the chocolate is melted. Stir until completely smooth. Allow to cool. Next add the melted chocolate, beating until it’s completely mixed into the cream cheese. Finally, beat in the heavy whipping cream and the Baileys until incorporated. Slowly fold in the whipped cream in two batches until it’s completely smooth. Pour the filling into the prepared crust, spreading evenly. Refrigerate for 3-4 hours minimum. Use a large open round tip and pipe a border around the cheesecake. Garnish with hot fudge sauce and chopped chocolate as desired. This turned out to be a hit at the Christmas party where I served it. Now that I have made it once, I think I have the process down and can do it from memory cutting the time in half. Excellent dish! Awesome John! 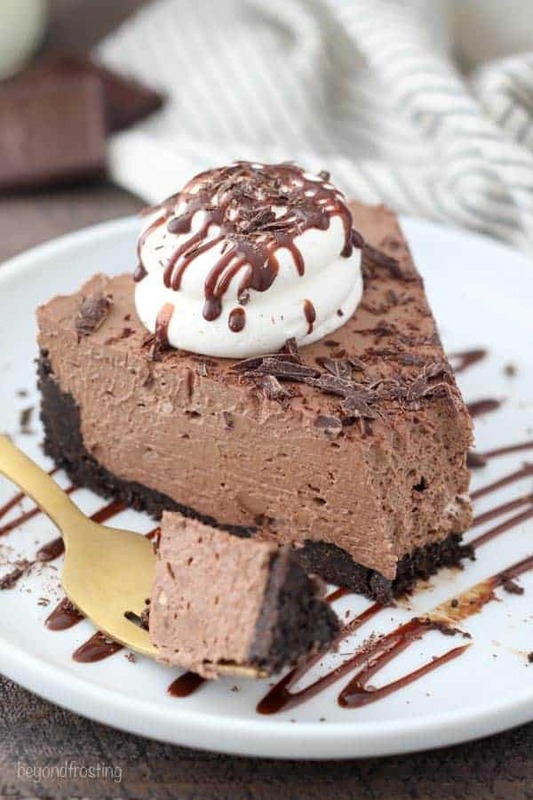 I have a few variations of this with a similar chocolate cheesecake base recipe if you’re looking to change it up. Enjoy!! So excited to make this! Two questions, can I sub for a different Irish cream brand? ( Carolans) and will adding a bit more of it to the recipe keep it from setting??? Hi Jenai, absolutely yes you can use a different brand. How much more are you looking to add? I love no bake desserts! Is there anything I can sub for the Bailey’s, since my desserts are usually served to kids, too?